CPT stands for Current Procedural Terminology and are published by the American Medical Association. Ranging from 00100 to 99499, the CPT codes are used to describe medical, surgical, and diagnostic services and procedures. Medical professionals like Physical Therapists use CPT codes to classify the treatment of diagnoses. ICD-9 Codes (International Classification of Diseases 9th edition) are used to classify signs, symptoms, injuries, diseases, and conditions. The idea is that the CPT code (treatment, service, procedure) matches up logically with the ICD-10 code (the symptom, injury, etc.). If the CPT code doesn’t support the ICD-10 code, you’ll have a problem – and you’ll likely have trouble getting reimbursed. The average therapist spends 1 to 2 hours a day writing notes for documentation. Save time with these well crafted, skill reflective, treatment specific documentation templates. 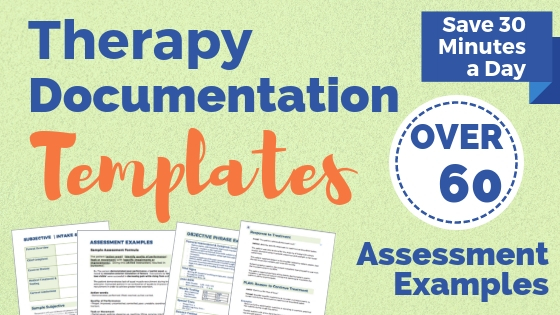 Click below to learn more about our therapy documentation templates. 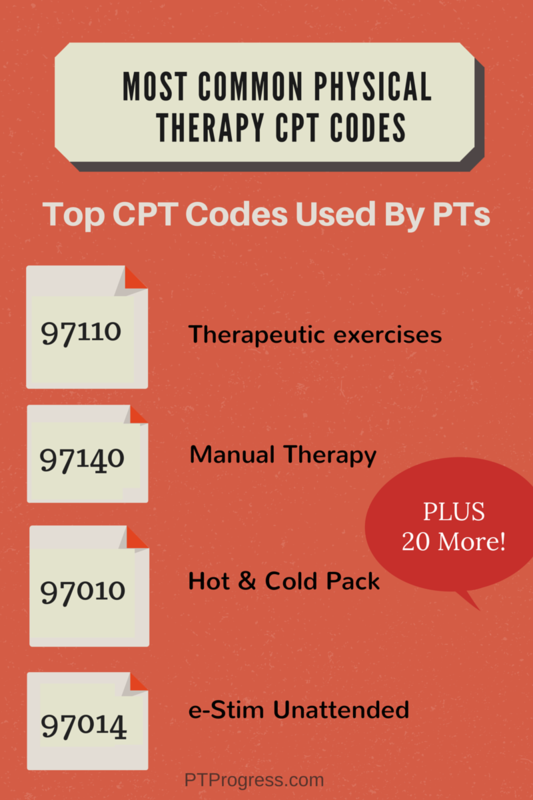 The most commonly used CPT codes for Physical Therapy are listed below. For example, the CPT code for physical therapy evaluation is 97001. The CPT code is listed on the left, the name of the code is in the middle and the description is in the right column. 97530 Therapeutic Activity Use of dynamic activities to improve functional performance. Describes the activities that use multiple parameters (strength, ROM, balance, etc) together and focus and achieving functional activity. Do you have any insight on CPT codes for new graduates or students? Share them in the comments! What is Dx M54.5 ? For the sheet that you send home with the patient to continue to do the exercises at home, what procedure code do you use? What code would you use for PROM if not manual therapy? Almost always I combine PROM with joint mobilizations (such as “PROM R shoulder abduction with inferior glide grade III”) but what if I just did PROM? It’s still a manual technique rather than therex, which the patient does themselves. I’ve never heard that you shouldn’t bill PROM under manual therapy. Also, what is “prosthetic checkout” vs “prosthetic management”? What does the “checkout” mean? Is that kind of like the “initial examination” for the fit of the prosthetic, and then if you were going to train them how to use it after examining it, then you would do training using “management” code? Strict PROM such as passive stretching after a total knee replacement, is not skilled manual therapy. Many times it is documented as such but should be considered therapeutic exercise. If you are using PROM as a check/recheck after performing tibiofemoral mobs or patellar glides, then it’s part of the manual therapy procedure you’re performing. It all comes down to documenting the procedure correctly. Another example – a squat can be therapeutic exercise, therapeutic activity, or neuromuscular re-ed! You just need to document your intent for the movement and how the skill was provided. The same is true for PROM. What code would you use for patient education during an out-patient PT appointment? For example, education about a patients condition, precautions or lifestyle modifications.